Great coffee is one of life’s little luxuries. If you take the time to calculate how much you spend each month in Starbucks or Costa, though…Well, that money might be better spent on acquiring a machine of your own. Today, we’ll take you through 15 of the best single serve coffee machines currently on the market. Check out our reviews so you can find the most suitable machine for your needs. They say you shouldn’t change a winning team and the classic Keurig K55 is still enduringly popular today. Enjoy the convenience of pods without compromising the quality of your coffee. Make up to 6 cups from a single reservoir and enjoy coffee in minutes at a fraction the cost of a Starbucks. III. How Can I Brew Ground Coffee With My Keurig Coffee Maker? IV. How Can I Brew My Coffee Without Keurig Logo Pods? Keurig are a market-leading brand in the world of single serve coffee makers. Set-up couldn’t be simpler. The K55 takes 5-10 minutes to calibrate itself and you’re good to go. Some coffee makers can be fiddly and awkward. With Keurig, you’ll have no such problems. Pop in a pod and use the handy button controls to choose your brew size. In under a minute, your drink is ready. The removable filter gives you a little more flexibility. Rather than being restricted to pods only, you can also opt for your own blend of coffee or tea if you prefer. If you enjoy coffee on the go, you’ll appreciate the stainless steel travel mug thrown in free of charge. Make yourself a piping hot drink for the daily commute. With a generous 48oz water reservoir, you can get 6 cups in before you need to refill. It’s a smart move to clean your cup as soon as the coffee is done. If you put it off, it can be a bit of a struggle. With no descaling functionality, you’ll need to get rid of the water by hand. Cleaning with vinegar is a good way to sidestep contamination. For a budget single serve coffee maker that performs like a much more expensive machine, the Keurig K55 is tough to beat. Adaptable, powerful and allowing you a wide choice of beverage, the K55 brings the quality of the coffee shop into your home without breaking the bank. Keurig continually strive to expand and improve their wide assortment of single serve coffee makers and with the K-Elite they’ve doubled down on adding a little more scope for tweaking than you’d expect from a single serve machine. You’ll have a choice of 5 cup sizes and you can fine-tune the strength and intensity of your beverage using the intuitive interface. You can program your machine to come on and shut off so everything is fully primed when you get up in the morning or return from work later on. The water reservoir can take almost 80 oz so you can rack up 8 large coffees before you need to remove and refill the tank. If you need a simple burst of hot water, there’s a button for that, too. The K-Elite is not just capable of hot beverages. If you want iced coffee the way it should be, hit the Iced button and you’re good to go. As with all Keurigs, speed is uppermost and you’ll have fresh, steaming coffee in your mug within the minute making it the next best thing to instant but with a far deeper, richer taste. The drip tray is also removable so you can slot in a larger travel mug fuss-free. With many of the second-generation Keurig machines, the bar code technology tied you in to a limited selection of pods. You can happily use non-proprietary pods in the K-Elite giving you the freedom to choose from over 500 different coffees. The K-Elite is finished in a highly attractive brushed metal so it will look at home in any kitchen. Since it occupies such a compact footprint, you’ll be able to leave this machine out proudly on display without feeling cluttered. 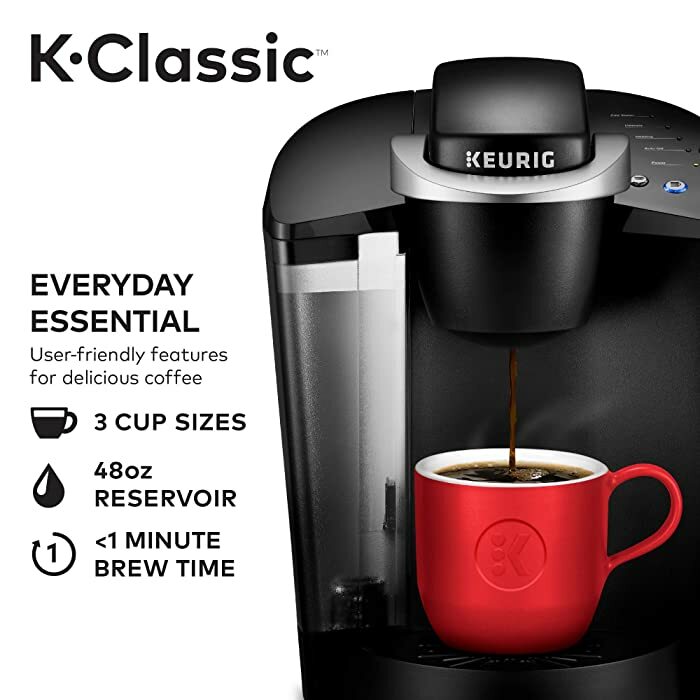 For a single-serve coffee machine with a difference, the Keurig K-Elite is tough to beat. Our best single serve coffee maker without pods reviews is the enduringly popular Ninja giving you incredible choice at a price you’ll love. And if it’s a steaming cup of joe you’re looking for, you can tweak the Ninja in so many directions it will feel like you’ve got your own mini-Starbucks at home but without the stiff daily bill. You can choose from 4 brew sizes depending on how much caffeine you want down the hatch, roll with a classic or rich brew and decide whether you prefer your drink black or milky then hit the button while the Ninja delivers. Want to get even more creative? The Ninja lets you pump in some concentrated coffee then experiment with layered drinks that catch the eye and tease the tastebuds. No product is perfect and the Ninja is prone to dripping slightly while the reusable filter makes for a messier experience than if you used pods but you’ll get the shower of benefits a pod-free unit serves up so we think that’s a fair trade-off. Rounding out with a pair of kickers, not only is this one of the best single serve coffee makers with no pods, the sleek black and chromed finish means it will stand out in any kitchen so what are you waiting for? Why choose hot or iced coffee when you can have both? If you can’t choose between enjoying full carafes of coffee or the convenience of single serve, why choose at all? The Hamilton Beach FlexBrew offers you the best of both worlds. You can also opt for fresh coffee grounds or K Cup pods for total versatility. As if that wasn’t enough, it’s incredibly value for money, too. Check out the FlexBrew today! Keurig is a household name in the coffee industry and with just cause. They make top-notch coffee makers which, while not exactly cheap, don’t cost the earth either. The core function of this coffee maker is single serve so it’s ideal for anyone looking for a super-swift caffeine fix without compromising quality. The large touch screen is a pleasure to use and perfect even if you’re not tech-savvy. The digital clock readout makes keeping tabs on the brewing time a cakewalk. You can punch in the time and make sure that your coffee maker switches on or off precisely when you need it. Energy saving mode is a nice touch. Using this machine couldn’t be easier. Just pop in your K Cup pods, punch the button and you’ll be drinking top-tier coffee in less than a minute. You can tweak the strength along with the temperature so you can enjoy your coffee just the way you like it without needing to head to Starbucks. If you fancy brewing up a whole carafe instead, pick one up separately and harness your Keurig to make larger volumes of coffee on demand. 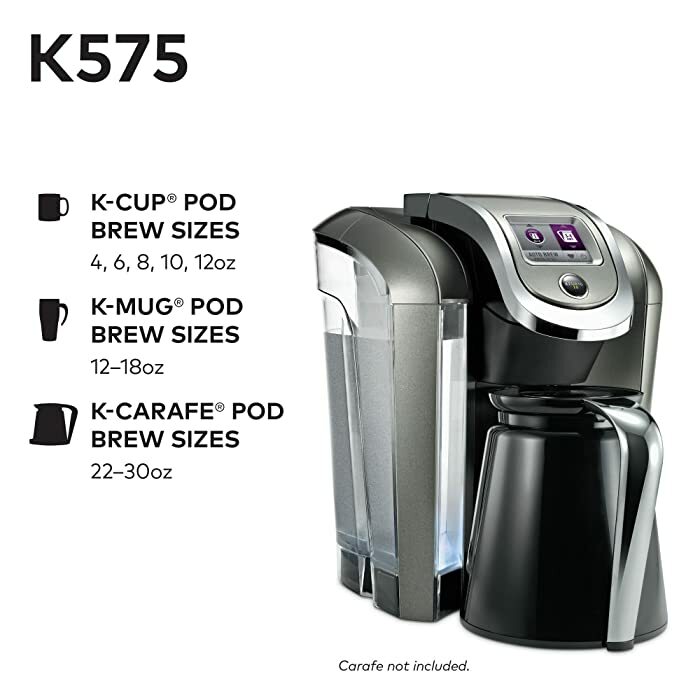 For a delicious single serve coffee without needing to take out a bank loan, give some serious thought to the Keurig K575. It delivers in fine style. 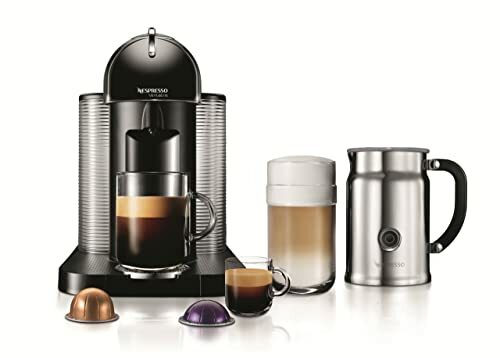 Next up in our look at the best single serve coffee makers is the VertuoLine from Nespresso. 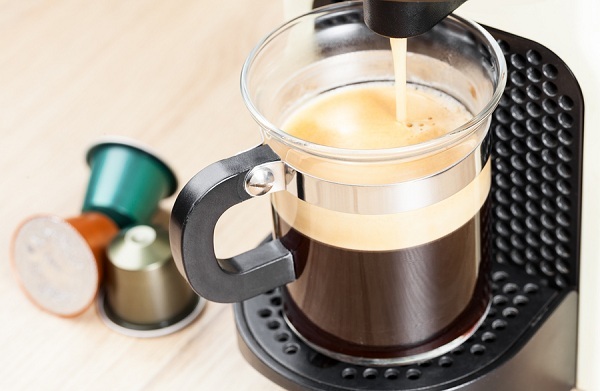 Nespresso are a dominant brand in the industry and, although not cheap, their products offer performance and reliability along with first-rate coffee. While it isn’t cheap, if you consider the money you would otherwise spend in a coffee shop, the VertuoLine doesn’t seem like such a bad investment. You’ll get either a dinky 1.35oz espresso or an 8oz coffee. The addition of the milk frother allows you to add cappuccino and latte to your repertoire. A welcome pack of 12 Grand Cru pods means you can enjoy fresh coffee straight out the box. Up to 20 used capsules will fit in the container before you need to empty it. Take note that only Nespresso VertuoLine capsules will fit in this machine. You won’t need to worry about tweaking settings. There’s barcode recognition in place. Whatever the type of coffee, you’ll get the optimum brew fuss-free. The Nespresso VertuoLine is a coffee maker that polarizes opinion. As you can see, there are a few drawbacks that we have honestly highlighted. Overall, though, if your budget will stretch to it and you’re an espresso fiend, the VertuoLine is well worth the investment. A real budget offering from Hamilton Beach next, this sleek single serve scoop coffee maker. Not everyone wants the restriction of a pod-based system. Sure, the coffee tastes great. But does your local store stock the capsules? Are they expensive? With the scoop filter, you can choose the blend and flavor of coffee you need giving you much more flexibility while also saving a few dollars. Although it’s not expensive, the slick stainless steel finish means this single serve coffee maker will look good as well as serving up a tasty beverage. The tray adjusts for different mug sizes. You can get an 8oz cup in 90 seconds and a 14oz travel cup in just 2 ½ minutes. That really is no time at all for a top-class coffee. The steel mesh scoop filter means there’s no ongoing expense or mess of paper filters either. You can flick between regular for drip coffee or bold for decaf, finer blends or flavored coffee. This is a nice touch. There’s no guesswork with 2 measuring lines showing you exactly how much coffee to use for the perfect cup. The wide drip tray at the bottom deals with any excess coffee. Watch out for any spattering, though. If you want to experience the joy of a single serve coffee maker at home without needing to spend a fortune, this silver beauty from Hamilton Beach is well worth popping on your shortlist. Rounding out our best single serve coffee machine reviews is a wonderful unit from Cuisinart, legends in the home appliances industry. This machine is not the cheapest but you’ll get outstanding coffee without needing to hit Starbucks every day. The massive 72oz reservoir means this machine is ideal for big families. Get all your breakfast coffee served without needing to endlessly refill. Although it’s very rudimentary to get this machine working, it also comes with a high degree of programmable functionality. You can even instruct the machine to make a drink at a set time which is a lovely touch. You’ll have a broad choice of drinks at your disposal. From K-Cups to ground coffee with the reusable filter, you can enjoy a strong, robust coffee any time you choose. Tweaking the temperature allows you to enjoy iced or hot beverages. For a flexible coffee making solution at a fairly keen price, the Cuisinart takes some beating. As we edge to the end of our best single serve coffee maker no pods hunt, this AdirChef machine is almost laughably cheap. If you peg your expectations, this is a first-rate coffee maker while it lasts, but be fully prepared for a shorter lifespan than you’d expect from a more robust machine. Aside from the price tag, less than a round of lattes from Starbucks, you’ll get a user-friendly and compact unit capable of making coffees up to 14oz in an attractive machine you wouldn’t imagine would be so cheap. Incredibly, you’ll even find a travel mug included and you can choose from a half-dozen colorways so there’s something to slot in with just about any kitchen. The permanent filter renders usage much cleaner and less tasky while you’ll also be doing your bit for the environment. Enjoy your coffee with a clean kitchen and an even cleaner conscience. While you obviously can’t expect performance on a par with a five-figure super-automatic espresso machine, we feel this budget machine from AdirChef more than merits its place on our shortlist. Synonymous with power tools, it might surprise you to find the legendary BLACK+DECKER venturing into the coffee vertical. This strong contender for the best single serve coffee maker without pods brings all that engineering excellence to the fore, though, with this top-tier pod-less beast at an exceedingly reasonable price. You’ll get all the safety features you’d expect from a pricier machine along with the main things that counts: first-class coffee served up at the push of a button without the endless expense of pods to worry about. You brew straight into a 16oz mug and you’ll be free to use pre-ground coffee or even pods if you prefer that convenience and don’t mind the expense. You’ll get the best of all worlds with this BLACK+DECKER. You wont’ have the hassle or expense of replacement filters and you’ll also be able to slip this scaled-down machine into practically any small kitchen or dorm room without overrunning the space. For the perfect combination of price, performance and ease of use, we can’t recommend this single serve coffee maker without pods highly enough. Road test one at your earliest convenience! Another extremely affordable single serve coffee maker comes next in our list, the Bunn My Café Multi-Use. If you swing between tea and coffee, both work well in this machine. You can also choose between ground coffee or pods. This means you’ll be much less restricted than with some machines where you are governed by a particular brand of pod. 4 removable drawers cater for hot water, K-Cups, ground coffee and pods so you have all bases covered. You can vary the size from a small 4oz cup right through to a 12oz beast to get your day started right. One significant drawback is that the reservoir only holds 14oz. This means you’ll need to refill before each use. This is a small price to pay, though. With programmable controls and a very simple interface, this machine is a cinch to use even if you’re not the biggest fan of technology. Convenience is king with single serve coffee makers so you don’t want to be waiting around. In less than 60 seconds, you’ll have a roasting hot beverage without needing a science degree to operate the machine. Since it’s a very small unit, the Bunn won’t take up too much space in your kitchen. For an extremely affordable entry point into the world of single serve coffee makers, the Bunn MCU is well worth popping on your shortlist. We’ll step up next with a far pricier option from the industry giant DeLonghi. There’s a neatly illuminated display which lets you choose from 2 coffee and 3 milk selections. If you’re looking for a straight espresso, the DeLonghi delivers in fine style. There’s no mess or measuring required with the Nespresso pods. As well as espresso, you can also enjoy latte or cappuccino so you’re spoiled for choice. Thanks to the milk container included, making this drinks is as easy as pushing a button. With self-priming functionality, coffee will be served in a mere 40 seconds. Auto shut-off is a great way to save on electricity when your machine is not in use. The default setting is 9 minutes but you can adjust this from anywhere between 30 minutes and a full 8 hours. The 30oz water tank is removable. Since there are no coffee grounds to deal with, cleaning couldn’t be less hassle. A self-cleaning feature makes your job even easier. While DeLonghi do not offer cheap products, you are buying into a highly reputable brand known for excellence in the coffee machine space. If your budget permits, the Lattissima Plus will not disappoint. Road test it today! Next in our single serve coffee machine reviews is another great model from Hamilton Beach. You have a wide range of choice with this extremely cost-effective alternative to the coffee shops. You can brew anything from a single cup right through to a 12-cup carafe. Although it’s not included in the package, if you have a travel mug this also fits neatly in. Choosing between a pod-system and something like this Hamilton Beach which uses ground coffee is purely personal preference. You get the best of both worlds here. The single serve side takes any K-Cups or ground coffee. It does work best with coffee you grind yourself rather than pre-ground. As with many coffee machines, there’s an initial smell and taste of plastic that you need to drive out. Run it with water only at first and consider cleaning with vinegar. General cleaning is a breeze with the carafe perfectly fine to pop in the dishwasher. If you are looking for a flexibile single serve coffee machine that doesn’t limit you to using a specific type of pod, Hamilton Beach is a name you can rely on. Back to Keurig as we near the end of our look at the best single serve coffee makers. The K15 is a consistently best-selling single serve machine available in an assortment of colors to fit with your color scheme. This model is at the lower end of the Keurig range but that does not mean you’ll get a shoddy piece of kit. You’ll get everything you would expect from this titan of coffee in a truly compact package. The world is your oyster with the K15. You can opt for coffee (K-Cups or ground) and it’s equally good with tea and hot chocolate. There’s no water reservoir which means no cleaning is required. On the flipside, the water needs to be reheated each time and you have to refill it for every drink. Brewing is slightly slower than some of the competition. With that said, you’ll still have a piping hot drink delivered in just under 2 minutes so it’s not all bad. It’s best to pour in the water before the K-Cup and you can choose from 6oz, 8oz or 10oz servings. If you want a Keurig coffee machine without needing a bank loan, check out the K15 and see if it fits the bill for your needs. If you want a single serve coffee machine for your home, office or small restaurant, the Keurig K145 is a smart choice. As with most single serve machines, you’ll have a steaming hot beverage within 60 seconds. That’s less time than it would take you to place an order at the coffee shop never mind wait for the drink. You can choose from 6oz, 8oz or 10oz cups according to your needs. All K-Cups fit nicely although you won’t be able to use ground coffee. Make sure thus fits your requirements. The 48oz reservoir means there’s no need to keep filling your machine with water before each drink. It detaches to simplify the cleaning process. There’s an old saying, “Buy cheap, buy twice.” With the Keurig K145, you’ll only need to buy once and you’ll have a machine that’ll last for years. As a welcome gift, there’s a pack of 12 K-Cups to get you started. For a rugged, functional single serve coffee machine that won’t let you down, the K145 is worth a place on any shortlist of the best single serves on the market. Suitable for all Keurig K Cup brewers, whether first (1.0) or second (2.0) generation, this generous pack of 40 assorted pods represents superb value for money while offering a broad spread of coffee. One thing to be aware of front and center is that this coffee is repackaged so you won’t get the original Green Mountain or Keurig packaging. This is stated clearly buy the picture shows the manufacturer’s packs so be aware of this before ordering. The beauty of this selection is that you’ll get a choice of 40 entirely different coffees with a guarantee that none will be duplicated. Whether you’re experimenting with coffee and not sure what you fancy or you’re just fickle and like to ring the changes, this bumper sampler pack offers you different coffee each day for more than 5 weeks! Marketed as a gift idea, treat yourself or your loved ones to this awesome coffee variety packs suitable for all K Cup brewers. You’ll get 12 packs of 6 single serve K Cup pods which brings the cost down to less than fifty cents a cup. For coffee this good, you really can’t expect it to be much cheaper. This package contains light roast coffee so it’s ideal for anyone with milder tastes. If you’re looking for a rich espresso flavor, this breakfast blend is not for you. Whether you want it to ease into your day or for a mid-afternoon pick-me-up, these pods offer coffee shop quality coffee at a fraction of the cost. The Green Mountain coffee is kosher and made from pure Arabica. Although it’s lightly roasted, you’ll enjoy a full flavor to perk you up whatever the time of day. Suitable for all Keurig machines, this breakfast blend coffee is a must and well worth popping on your shortlist. If you want to step things up a gear and you’re partial to medium roast coffee, this pack of 72 pods from The Original Donut Shop might be just what you’ve been looking for. Packed with more coffee than regular K-Cup pods, this bold and strong Arabica is wonderfully balanced. With a rich aroma, you won’t get any harshness or bitterness but it’s packed with flavor to liven up your day. As with all these packs of K Cup pods, you’ll be able to pop them in any Keurig machine whether it’s the older 1.0 version or the rebooted 2.0 that you own. If you find this coffee to your taste, The Original Donut Shop has a wide range of other options from decaffeinated through to flavored coffee and everything in between. Check out some of this prime medium roast Arabica today from a brand you can trust at a price you’ll love. For something cheap, cheerful but not lacking in flavor, try this smaller package of 24 medium roast pods from Eight O’Clock Coffee. These medium roast Arabica beans are robust and exceptionally smooth delivering a taste sensation without overwhelming you. Suitable for use in any compatible Keurig coffee maker, you can reap the benefits of a super-convenient single serve drink with no mess to clean up like you might get with a French press or Moka pot. If you think investing in a machine and pods is costly, try comparing it to a daily run to a coffee chain and the sums suddenly start looking rather more attractive! Eight O’Clock coffee has been in the coffee business since 1859 and they control every aspect of the process from choosing the beans right on through every step of production. For top-grade coffee from a brand you can rely on, roll with this pack of pods and you’ll be coming back for more! If there’s one name that springs instantly to mind when you mention coffee, it has to be Starbucks. For anyone who can’t get enough of their coffee but doesn’t have the time or the budget to visit a branch daily, this pack of single serve breakfast coffees is a winning solution. Compatible with the Keurig Single Cup Brewing System, these nifty little pods offer outstanding coffee without the mess or ceremony. The 10 pack of 6 coffees reduces the cost to an extremely manageable level and should last you a month or two depending on your consumption. The breakfast blend is a medium roast boasting citrus undertones for a fresh and smooth fix of caffeine without the flavor or aroma being too dominant. From blonde through to dark roast with a healthy dose of flavored options as well, once you get amongst the Starbucks range of coffee, you won’t turn back! Keurig coffee machines are a fantastic innovation allowing you to enjoy single serve K Cup coffee at a fraction of the cost of hitting the coffee shop without sacrificing the quality of beverage you’ve grown accustomed to. The cost of the regular pods can be prohibitive for some so many manufacturers have started to produce coffee that’s compatible with these machines. One such option at your disposal is this outstanding variety pack with a staggering 120 cups of coffee from San Francisco Bay. By buying in such bulk, you can bring the cost per cup down to less than forty cents. You really can’t ask for much more than that. Focus on this cost rather than fixating on the price tag and it suddenly seems like the steal of the century. 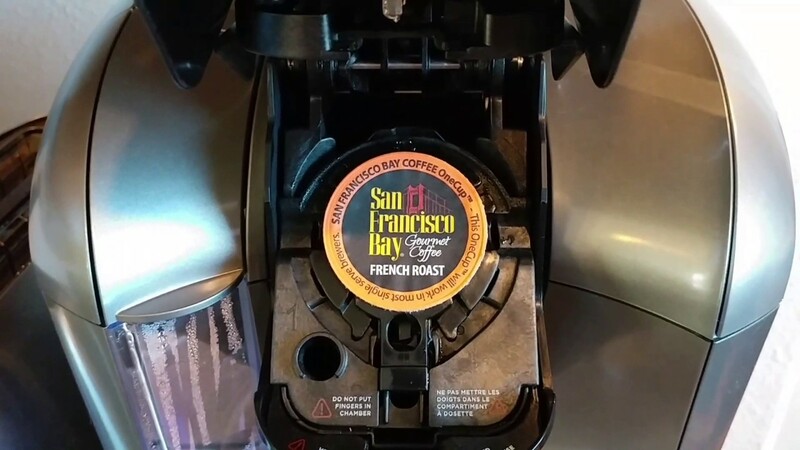 French Roast: A classic French Roast is hard to beat and San Francisco Bay have nailed it with this pure Arabica. It’s roasted extremely dark so the oils rise right up to the surface. With a certain smokiness and a full, robust flavor, this is a must for coffee fiends but proceed with caution! As you can see, the world’s your oyster if you invest in this bumper pack. Whatever mood you’re in and whatever the time of day, you’ll be confident of pulling out a coffee to match. If you need to make sure you’re coffee is kosher, all San Francisco Bay produce is certified by a local rabbi with some coffee awarded the coveted Star K.
This company takes their coffee extremely seriously. They own 3000 acres of farms where they experiment with a range of beans and blends so they can get things absolutely perfect without needing to jeopardize the livelihood of growers until everything is ironed out. This family-owned company does plenty more good in the form of their Grown For Good charitable program which helps out those who need it most in many areas from education to sanitation. When you invest in their coffee, you not only get a great drink but can play your part in improving the lives of the needy. They don’t work with the Vue or the forthcoming Version 2 so what can you do about that? Get a regular, used K Cup pod. Make a couple of slits around the top. Pop your San Francisco Bay pod inside and you’re away laughing! Check out this handy video. It’s only a couple of minutes long and shows you precisely how to achieve full compatibility. Now what are you waiting for? Order up some of this awesome coffee and get your day started the right way! While K Cup single serve coffee is undeniably convenient, how about if you feel like some fresh ground coffee instead? Fortunately, there’s an easy solution in the form of the Keurig 2.0 My K-Cup Reusable Coffee Filter. Brewing up a whole pot of fresh coffee is not always practical. Perhaps you’re in a rush and know you’ll only get chance to down a single cup. Maybe you’re the only coffee lover in your house but you’re not prepared to forego your preferred tipple completely. For various reasons, many people want the convenience of a single serve beverage without sacrificing the flexibility of freshly ground coffee. We strongly recommend buying the single filter. It’s also available as a 2-pack but, inexplicably, the price of this is almost triple the cost of a single unit! This is absurd so, if you want a pair, buy them separately rather than as a package to save money. Although other reusable filters might technically fit into the Keurig 2.0 or Keurig Plus coffee brewer, this is the only one officially approved so, especially considering the ultra-low price, it’s better to be safe than sorry and stick with this nifty little filter. If you fill the filter completely, you should be able to rustle up a 14oz cup of coffee which is more than enough for most needs. The first thing to be aware of is not a flaw per se but more a case of slightly misleading advertising. The filter is stated as being compatible with the Keurig 2.0 and Keurig Plus. This is true but these are the only brewers it will work with. Maker absolutely certain you have one of these machines to avoid disappointment. A reasonably large body of users have reported back compatibility issues and warning messages popping up. Others have questioned the authenticity of the product. In the interests of accuracy, we feel duty bound to point out that this filter does not claim to be an official Keurig product merely to be compatible. We’re certainly not here to give you the hard sell and you need to make up your own mind whether or not to take a chance on this great little filter. It’s extremely good value so, if you can’t give up your freshly ground coffee but want it brewed up in smaller quantities than a carafe, check out this filter today and you might just be pleasantly surprised. Is it possible to use generic coffee pods or pods from other manufacturers in your Keurig coffee maker? When any brand attempts to place a stranglehold on things forcing you into using their products only, there’s bound to be a backlash. This is doubly true if the products in question are relatively expensive and there are far cheaper and equally serviceable alternatives around. In today’s buyer’s market alongside a wealth of information at our fingertips thanks to the Internet, solutions to just about any problem are never more than a few keystrokes away. We’d like to make it quite clear here that we are not encouraging you to use non-Keurig pods in your pride and joy. We’re simply here to help you out if you’ve already made the decision to road-test some other coffee pods in your brewing system but you’re not sure how to go about it. 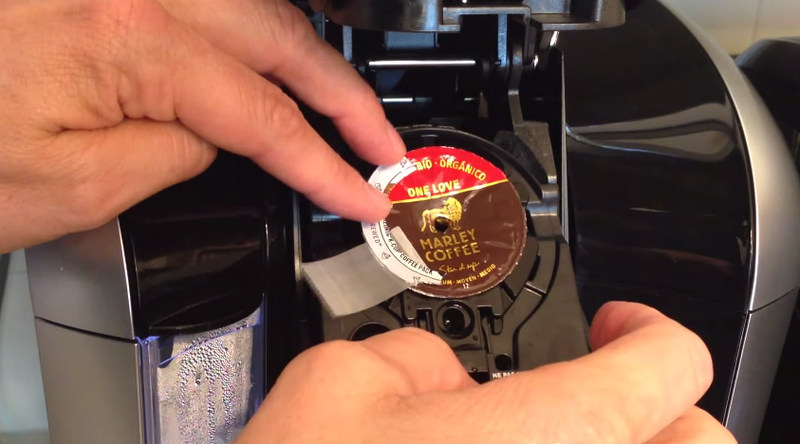 This neat little video outlines exactly what you need to do to override the bugbear of Keurig’s heavy-handed approach to insisting you use only their pods in your machine. All Keurig brewers have a Digital Rights Management (DRM) system which effectively locks you out and prevents you from using any non-standard pods. To salt the wound, if you have a Keurig 2.0, these machines are not backwards-compatible so you won’t be able to easily make use of any older pods you have to hand. The new 2.0 machines feature a special kind of ink to guarantee you would not only buy their machine but also their pods. On an ongoing basis. The official line from Keurig’s is that this militant attempt to ensure you play ball was for your own protection from shoddy merchandise. Now, not only do the pods need to conform to certain dimensions, the machine is also capable of detecting whether there’s the special infrared ink in place too. These non-Keurig “rebel K Cups” can easily be slotted inside a bona fide pod. You see, all you actually need to circumvent the DRM is the part of the food where the special ink is. By slipping a rebel pod inside, you by definition conform to the size required into the bargain. Locate the infrared reader inside your Keurig per the video’s instructions. Cut off the part with the special ink from an official Keurig pod. Take some transparent tape and affix this so that the machine will automatically detect the ink it’s expecting to find. Now, each time you want a cup of coffee, the choice is yours which brand of pod you’d prefer. To reiterate, we are not inciting you to go ahead and use non-Keurig pods. If you decide this is something you’d like to try out, though, we can vouch for the effectiveness of this straightforward workaround. Single serve machines manage to hit all of those pain points without costing a fortune. Keurig Green Mountain sits at the top of the pile when it comes to these innovative coffee machines. They managed to bring in almost $5 billion in revenue in a single year and much of this income is attributed to their K-Cup single serve machines. How about the effect on the environment for the sake of convenience? These capsules are not biodegradable or recyclable. On the plus side, their clinical efficiency means they use very little electricity. There’s no need for them to keep a large pot of water heating. While these machines have continued to rise in popularity, most of the leading manufacturers are now seeing something of a drop in sales. As the economy improves, people are more inclined to return to their favorite coffee shops. Overall, though, these machines are certainly not about to fade away. If you live alone and like to drink coffee, the last thing you want is to brew up massive quantities you’ll end up wasting. With a single serve, you can brew up just the amount you need, no more and no less. This reduction in waste will save you money over time. The majority of single serve machines are a cinch to set up straight out the box. When it comes to operation, just fill up the water, load the coffee and hit a buttonIn just 1 or 2 minutes, depending on the brand, you’ll have a first-class coffee, tea or chocolate at a fraction the price of a cup from your local coffee shop. Functionality varies, usually according to price. The better machines allow you a great deal of scope with programming so you can set the machine to serve you up at designated times. Some people want a tiny espresso while others prefer a hulking great mug. As you’ll see from the above product breakdowns, most of the best machines give you a great deal of freedom in cup size. Just choose the size you want, hit the button and you’re good to go. Most single serve coffee machines are compact so great for even small kitchens. If you live alone or in a small apartment, one of these machines is a fantastic way to enjoy shop-grade coffee without leaving home or overcrowding the counter space. Cleaning conventional, large coffee makers can be a real pain. Single serves present no such problem. Check closely for reports on cleaning and maintenance for the model you have in mind. User reviews generally paint a pretty honest picture. Cleaning is normally a very swift and relaxed affair while ongoing maintenance should be at an absolute minimum. Let’s face it, coffee chains produce great drinks but at quite a price. It’s easy to find your spending spiraling out of control. Single serve machines allow you to enjoy top-notch coffee without spending thousand of dollars a year. The best coffee machine represents a sound long-term investment. While single serve coffee makers, championed by the legendary Keurig and now replicated by other brands across the world, are super-convenient, they also come with a significant downside. We’ll walk you through 3 reasons, read on. Any product packaged up in micro-doses will always be more expensive. This logic applies with capsules or pods. This cost is obviously passed on to you, the customer. There’s no way around it, coffee pods are expensive and you’ll also have the hassle of sourcing them and ensuring you always have a full supply. Buy freshly ground coffee, on the other hand, and you can make dramatic savings while arguable enjoying superior coffee into the bargain. While you could argue that buying these capsules is nowhere near as expensive as a daily coffee shop run, you wouldn’t really expect to pay Starbucks prices to drink at home. Since so much plastic is used in the production of those convenient pods, to say the classic single serve model is eco-unfriendly is a colossal understatement. Companies like Keurig have stated publicly they intend to make a complete shift to use recyclable pods by 2020. Even if they do hit this target, recycling this type of material is riddled with complications. It also requires other manufacturers to follow suit. This may or may not happen. Don’t get us wrong, most major brands have a pretty impressive selection of pods to choose from. It’s not like you’ll be forced to choose between just a couple flavors. The thing is, will your favorite blend be on the list? If not, you’ll be forced to go without or drink something that for you is second-best. Or, you could invest in a single serve coffee maker with no pods and continue drinking exactly what you want. Also, if you appreciate the advantage of grinding your own beans directly before brewing so you can get the ultimate in fresh coffee, you wouldn’t be able to do that with a pod-style machine. We trust you’ve enjoyed these single serve coffee machine reviews. If you take the time to do plenty of reading and research, getting the best machine for the job is not rocket science. Feel free to drop us a line if you have any questions or feedback. We’re always delighted to hear from our readers. Now go and get that coffee on! Hamilton Beach 49976 Flex brew 2-Way Brewer. And have to add water every time you want to make a single cup? No thank you. The Cuisinart Coffee Center SS-15 is a better choice. When my special addition Keurig died, I needed to replace it. It was around $250. I was tempted to buy the same one because I didn’t expect this one, which you recommend, (Keurig K55 Single Serve Coffee Maker) to be as good at around $90.